Heidi Heckelbeck sees things differently in this whimsically witchy chapter book. When her friend Lucy Lancaster gets glasses, Heidi notices all the attention Lucy gets and decides that she, too, needs a new look. In order to get glasses, Heidi pretends that she has trouble seeing. All goes as planned and Heidi gets a cool pair of glasses—but when she puts them on there’s just one problem: She can’t see a thing! 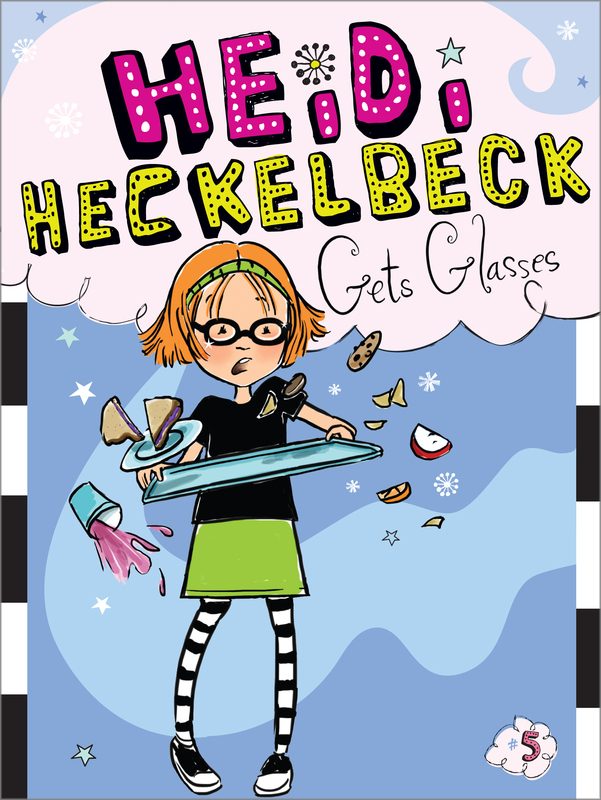 Heidi walks around with fuzzy vision and makes many messes until she realizes that she doesn’t need a pair of glasses to make her special. Heidi Heckelbeck sat at her desk and fiddled with her kitten–shaped eraser. Where’s Lucy? she wondered. Lucy had told her that she had a surprise, and Heidi wanted to be the first to know. She pulled out a berry-scented pencil and sharpened it. Heidi looked away for only a moment, and that’s exactly when Lucy walked in. “Ooh!” Heidi heard somebody say. A bunch of kids had already gathered around Lucy. It must be something important, thought Heidi. She rushed to the door and wiggled her way into the middle of the crowd. “Surprise!” said Lucy when she saw Heidi. “Wow, what?” asked Charlie Chen, who had just walked into the class­room. “Lucy got glasses!” shouted Heidi. Lucy’s glasses had brown frames with pink sparkly flowers at the temples. “Wait—let me see!” said Melanie Maplethorpe, pushing her way to the front. Melanie must have liked Lucy’s glasses, because she didn’t say “Ew” or anything else like that. “They make you look smart,” said Stanley Stonewrecker. “They make you look hip!” said Natalie Newman. “They make us look like twins!” said Bruce Bickerson, who also wore glasses. Lucy and Bruce slapped each other five. Lucky Lucy, thought Heidi. She’s getting so much attention for her new glasses. Heidi had to admit, Lucy’s glasses were really, really cool. Everyone scrambled to their desks. Mrs. Welli noticed Lucy’s glasses right away. “Thanks,” Lucy said with a smile. All day everyone made a big deal about Lucy’s glasses. During English, Mrs. Welli read from a book of poems. Then she asked everyone to write their own. At the end of class Mrs. Welli asked Lucy to read hers out loud. Heidi knew why Lucy got picked. It was because of her new glasses. Lucy stood in front of the class and pushed her glasses to the top of her nose. I can see so far away. on the playground clear as day. even if I’m in the last row! Lucy curtsied and returned to her seat. In art, Lucy got the same kind of attention. Mr. Doodlebee even drew a picture of Lucy with her glasses and hung it on the bulletin board. I wish Mr. Doodlebee would draw a picture of me, thought Heidi. The problem is, I don’t stand out. I need a new look. . . .
Heidi smiled to herself. Aha! I know just how to get one.